Apricot White Chocolate Cookies will have you salivating after your first bite! These luscious cookies start with my favorite cookie dough, but instead of chocolate chips, I substitute white chocolate chips. I also add dried apricots and sliced almonds for incredible texture and flavor. These cookies are wonderful for holiday baking and gift giving. I love apricots in baked goods even though I'm not a big fan of them fresh. Our favorite Apricot Almond Bars just can't be beat. We have made them for our annual Christmas Cookie Extravaganza many, many times. But apricots also good in thumbprint cookies, with coconut, cream cheese, and shortbread. 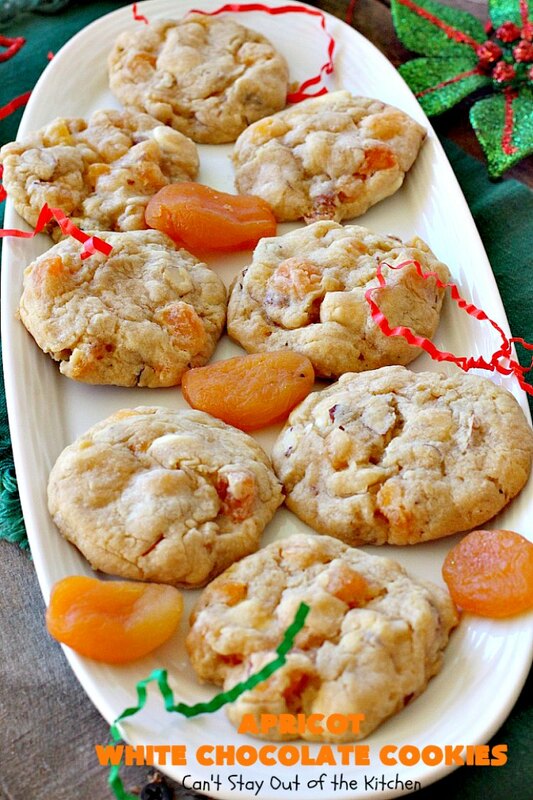 Whether using diced apricots like in my Fruitcake Cookies or preserves they both work exceptionally well. We baked a lot of cookies this year, and I have to admit to being really glad to be able to enjoy the holidays without any further baking! These Apricot White Chocolate Cookies turned out incredibly well. Of course, I'm a big white chocolate fan, so adding white chocolate was a win-win for me. Add in some crunchy, sliced almonds and this cookie had everything going for it. If you're looking for a terrific cookie to take to your holiday parties or Christmas Cookie Exchanges, this fruit-filled cookie should be on your list. If you enjoy apricots, you'll love these cookies. Place in a bowl of hot water for about 10 minutes to plump and reconstitute apricots. Stir in flour, drained apricots, white chocolate chips and almonds with a wooden spoon to combine. 0 Response to "Apricot White Chocolate Cookies"